One of our staple restaurants in VivoCity is Shin Kushiya, which specializes in Japanese barbecue grill. They have a good selection of meat and veggie barbecue at very reasonable prices. Each barbecue ranges from about SGD 2.00 to 15.00. My husband and I normally order a whole range of barbecue dishes, but only decided on 2 of our favorites for this visit. We had the Nikuzume Shiitake (SGD 2.80) and the Gyu Enoki Maki (SGD 3.80). 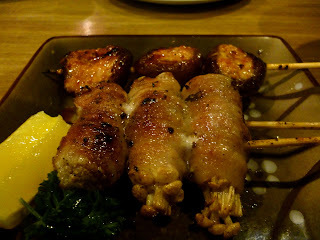 The Nikuzume Shiitake is shiitake mushrooms stuffed with ground chicken. The shiitake mushrooms were really tiny that day -- so they gave us 3 instead of the usual 2 pieces. Though the size was disappointing, the quality was still just as good. 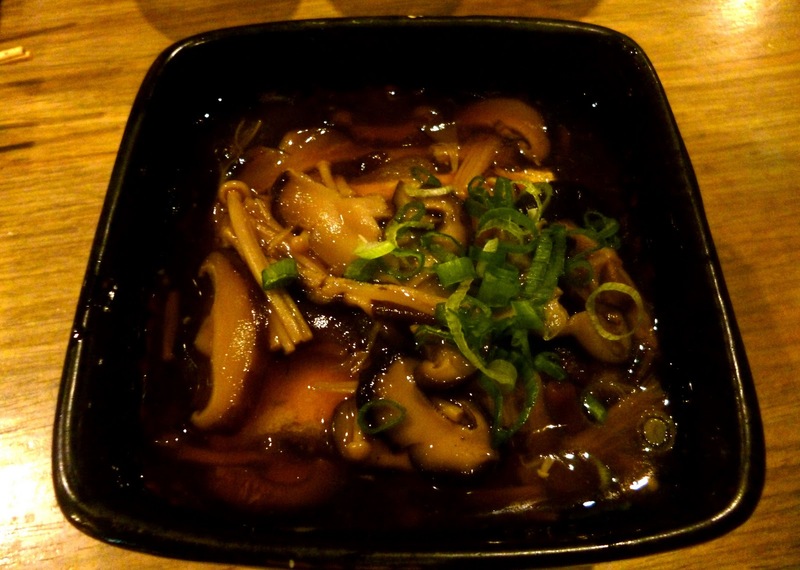 I love the marinade they use and how the flavor is nicely absorbed by the mushroom. The Gyu Enoki Maki on the other hand is a bunch of enoki mushrooms wrapped in beef. This was nicely done as well, and the marinade was just as delicious. We also ordered the Kinoko Tofu (SGD 7.80). This is a silken tofu with japanese mushroom. This was another good dish, and I like how the breading of the tofu did not get overly soggy with the sauce. 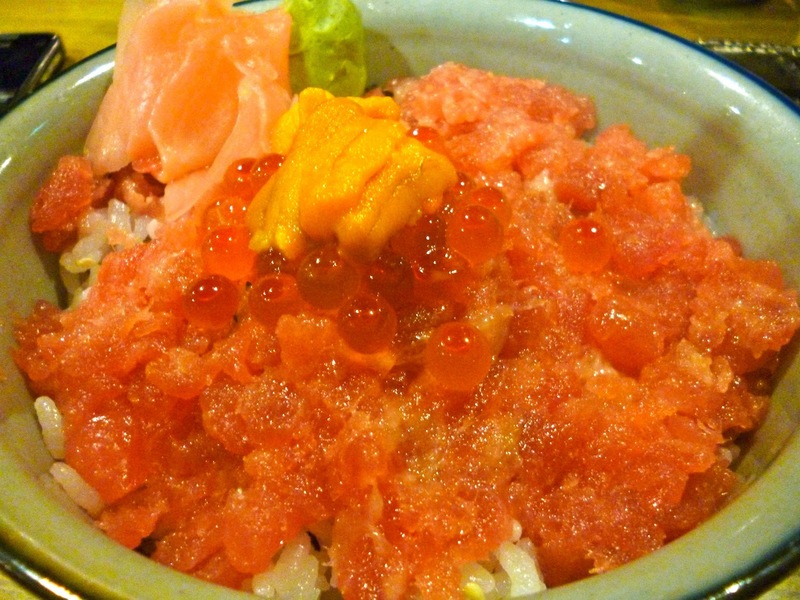 For mains, my husband and I ordered different types of don buri - I had the Premium Mini Hokkaido Don (SGD 28.80). This had raw tuna belly, salmon roe and hokkaido sea urchin. This was decent, but nothing amazing. The freshness of the seafood was alright. My husband ordered the Shanshodi Udon (SGD 17.00). This had slices of salmon, tuna, and swordfish. Also decent, but again nothing to rave about. The slices of sashimi were a little on the thin side. 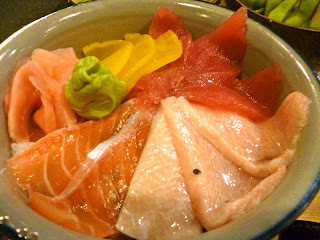 I think that sashimi is not really Shin Kushiya's strong suit. However they do have excellent and very decently priced Japanese barbecue. So I will recommend this place for their well executed grilled dishes which I always do come back for.